Crota's End is the new Raid included in the Dark Below DLC. Moving away from the Vault of Glass on Venus, players venture to the Moon to take on the The Oversoul BOSS and resist the onslaught from the Hive. Just like VoG, players need to understand the mechanics of the raid to build their strategy and complete the raid successfully. In this post, I'm going to cover every section of the Raid and provide a Raid strategy for each. Let's not forget that Bungie love to patch things, usually soon after a particular strategy is discovered. I'll do my best to update the strategy as new things are tweaked and players find new ways to make it through. Since this Raid takes place on the Moon you'll encounter the full range of Hive enemies you've come to hate. This includes Thralls, Knights and of course the cowardly Wizards. The shear number of Thralls is enough to terrify any newcomer. The environment of Crota's End is much darker than that of VoG. As you first venture underground the Raid becomes darker and more dangerous than previously known. Light is a contributing factor to the difficulty of Crota's End. The Sword weapon plays a major role in this Raid, requiring team members to communicate well and perform perfect timing to cross bridges and ultimately defeat Crota. Which level should you be? Although Bungie said that Crota's End is a level 30 raid you would be wise to run the Raid with mostly Level 31's. The reason for this is because all the majors and ultras you come across are level 31 or 32. Thus any level 30's have a penalty applied to their attack damage, no matter how good their weapon is. The raid is also full of knights rather than wizards. Sword Bearers are the common level 31 enemy, making them difficult to kill off for any under-levelled players. This penalty is also very apparent when you get to Crota who laughs in the face of most Level 30's, making the final stage very frustrating. To make things easier, consider buying and upgrading the new weapons sold by Xur and the Tower Vendors. They have a much higher damage rating, which can be upgraded to Attack 331. These ratings will surpass all the Legendary gear that you earned from the Vault of Glass. Lastly, avoid running the raid with Level 29's because the truth is they'll be severely hampered by the penalties. Those with the Helm of Saint-14 helmet have the perfect special ability for this Raid. This particular helmet has an upgrade perk called Starless Night which blinds enemies that steps into the Titans bubble. This is perfect against the hordes of Thralls in the early section of the raid, literally stopping them instantly, but it also comes in handy towards the end when you need to block off a particular entrance as you take on the Deathsinger wizard. Aside from this, the standard bubble is less effective during the "Transverse the Abyss" stage because the Thralls melee attack is too frequent and strong to allow you to hide in the bubble. I suggest running with the Striker class and smashing during intense moments, you will also have a stronger lightning grenade against the Sword Bearers when you come to cross the bridge. It's also worth switching your Titan's training from strength to agility for the first part of the raid. You'll want to keep up with the group at all times. Hunter's really shine throughout the raid thanks to their invisibility, blade dancer skills and superior agility. You can literally SOLO the first part of the raid just by using the invisible super, claiming the chest and even forming the bridge to take the first Raid reward alone. The warlocks spam grenades are always useful for controlling spawn points and enemy pathways, but most of all the self revive perk is priceless. Not only during the first darkness stage when a warlock could get left behind but also later in the game when players split between the two sides of the bridge. SOLO players will also reap the benefits from the self revive, giving them countless extra opportunities to retry the harder sections of the raid alone. Although you'd expect the Raid to require Solar and Arc weapons this is not the case in Normal mode. Unlike the Nightfall which has countless enemies with shields, the Raid doesn't have many apart from the wizards. Therefore Solar is your first choice, but any damage type will be acceptable. What is more important is the strength of your weapon. Newly acquired weapons will have higher attack ratings, going beyond the 300 limit. These will prove just as useful as say a Vex Mythoclast which has Solar damage. All of the Legendary Raid weapons will prove useful in helping you push further into the Raid and compete again on Hard mode. For example, The Oversoul Edict Pulse Rifle has an upgrade that allows projectiles to over penetrate against the Knight's Wall of Darkness. This is just one example where a Raid weapon has an upgrade path suited to the Raid. Abyss Defiant (Solar Auto Rifle) - "Lich Bane" upgrade: projectiles have a chance to disorient Hive Wizards. Song of Ir Yut (Arc Machine Gun) - "Dark Breaker upgrade: projectiles over penetrate against Knight Wall of Darkness. Upon entering the Raid, players will be faced with a bridge which is incomplete. Standing on the circular pad before the bridge will eventually extend the bridge, leading to the entrance to the Hellmouth. Once you enter the Hellmouth, the first area requires players to navigate in the dark whilst fending off Thralls and Cursed Thralls. It’s very difficulty to see where you’re going apart from the lanterns and the Thrall’s green glow. The first raid chest can be found here and it’s possible to get the rewards playing SOLO. Simply walk forward along the brick path and take the first left. This path leads straight to a door which sometimes has a light on it to signify the chest is inside. If it doesn't spawn here, just "hug" the wall and follow it round to the right to find the next room and check for the chest. To complete this section you must follow the lamps (which are white pillars) that guide you towards the end of the darkness and another bridge. Standing nearby a lamp too long and it's colour changes from white to yellow, then explodes before changing to red to signify that the lamp is gone. You can easily die when they explode. You should move carefully from lamp to lamp to reduce the Weight of Darkness allowing you to move freely again and jump. I suggest moving quickly for two lamps, then stopping at the second to drop your Weight of Darkness. When the weight is cleared, move on again for another two lamps. Repeat this process. At the end of lamp section there's another incomplete bridge. Players need to stand on a platform whilst fending off Hive until the bridge is complete. It takes around 1-2 minutes for this stage to complete. Once the bridge is complete players can run until the bright white light, at this point a checkpoint is reached and a raid reward is handed out. Another bridge that's incomplete but this time players need to split up and hold different circular totems. Very similar to the Vault of Glass entrance where players had to stand on the circular "plates" until enough time passed. A suggestion would be splitting into 3 teams, 2 per pad and a team of 2 in the middle. When the bridge is ready a message will appear "The bridge is fully formed". Now the important part. At this point someone will need to kill one of the "Sword Bearers" and claim the sword. ONLY with the sword can you cross the bridge and kill the Gatekeeper on the other side. You don't have to kill the Gatekeeper to finish this section but it can get tricky if too many Gatekeepers spawn. Titans have an advantage here because their Flashbang grenades can blind the Gatekeeper making it easier to kill him with the sword. There are three totems on the other side of the bridge so for every person that crosses the bridge they can hold a particular totem, freeing up someone on the opposite side. You only need to hold three totems at a time to keep the bridge open, one on the left, one on the right and one in the middle. It doesn't matter which side of the bridge they are. As soon as a Guardian crosses the bridge they can start to kill around twenty ads before two Orges spawn in, one either side. Killing off both of these Orges will earn your team the second reward from the Crota's end raid. Once you cross the bridge, kill approximately twenty ads and the two Orges will spawn in. Now race against time to kill the first Orge before the Totem warning appears. Once the first is killed off, the second Orge provides minimal resistance and all other ads will despawn as soon as he is killed. Before you reach the Summoning Crystal section you have to fight through a narrow corridor which is infested with many Thralls. At the end of the corridor lies another raid chest but it's set on a timer. In order to claim the chest, one guardian will need to sprint through this section and reach the chest before the doors close - Indiana Jones style. It's not as easy as jumping your way through either. Two shriekers block the corridor with invisible walls. Players need to kill the Shrieker to remove it's invisible wall whilst avoiding the Thralls below. Thankfully, there's a number of small pillars which players can perch on top of, providing cover from the Thralls below. "The Deathsinger prepares her song"
TIP: You can delay the countdown timer by not killing the two knights at the entrance. Simply run past them into the outside area and start tempting the wizards, whilst the rest of the team follows behind. To complete this section you need to kill the Deathsinger wizard to prevent her from singing. This requires you to tempt two of the Wizards behind the shield out into the open, and then killing them both. Once they're both killed, race back to the Deathsinger room and destroy the Shriekers either side. This will remove the invisible wall giving you access to kill the Deathsinger. During this section a good place to hide is in the rooms on the 2nd level i.e one level above the wizards. These provide safety from the Knights. Secondly, I recommend sending one Guardian in alone to jump like crazy and tempt out the Wizards whilst the rest of the team Sniper them from safety. You can try clearing out the entire area of Knights first then move to the upper level but you'll need to be really quick to have enough time left for the final Wizard. Titan's with bubble shield can strategically cover entrance doors to the Deathsingers room, buying you some time to focus in one direction. This is the last section of the Raid where Guardians must fight against Crota. During the final section, a negative buff is applied to all players called "Presence of Crota". This debuff restricts your ability to heal making the final section incredibly difficult. In order to heal, players need to claim the "Chalice of Light". This collectable item can be picked up from the middle of the area, allowing the bearer to automatically heal themselves. 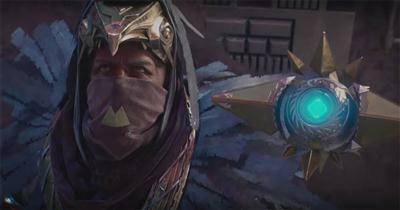 Unlike the VoG where the relic could be used to cleanse marked players, the Chalice of Light will only heal the bearer and must be passed onto other Guardians so they can heal themselves too. You're going to need good communication to know which players need healing as they'll be no visual indicators like in VoG. Another important item is the Sword which one player can claim by killing a Sword Bearer knight. The sword is the only way to kill Crota. Close proximity is required for this and other players in the team will need to buy the Sword Bearer some time by killing off the plague of Hive which comes flooding in. All players can take down Crota's shield using standard weapons, at which point he will crouch and attempt to regain his shield. This is the time to strike with the sword. If a player dies then Oversoul (the huge green ball) will spawn and needs to be killed quickly otherwise the entire team dies. If too many players die then Crota becomes enraged, making the fight impossible and requiring players to wipe. For this section of the Raid it's recommended that players clear out the first level of Hive then take their positions on the LHS and RHS rooms. The majority of players will go left, while a single player goes right to snipe the boomers. The rest of the players keep watch for the Swordbearer whilst another player snipes the LHS too. Once the knight goes down, one player (preferably the highest level player) grabs the sword and they must co-ordinate the strike on Crota to bring his shields down. This player should have enough time to perform two separate attacks on crota in time before the sword despawns. I suggest picking up the sword when Crota is in the middle to make things easier. After the 2nd or 3rd attack on Crota, Orges will spawn. At this point all players should retreat to the starting room and safely snipe from distance. Only once the Orges are killed should players move back upstairs and repeat the process. It should only take 3 or 4 attempts to kill Crota if the correct "smash" technique is used rather than swiping with the sword. Of course, any players less than level 32 (Crota's level) will need more attacks to finish him off. 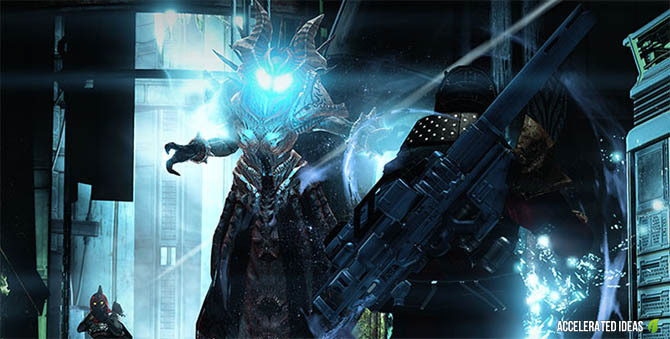 The final BOSS for the Raid is Crota who can call in the Oversoul when a player dies. One of the mechanics for this BOSS is the Oversoul Gaze which much like the Templar boss on the VoG can kill all players at once. The Relentless Harness Chest Armour provides an upgrade perk called "Moment of Speed" which grants players a faster reload during the Oversoul Gaze. Similarly, the Unyielding Casque Helmet also provides an upgrade for the Oversoul Gaze mechanic. This upgrade is called Moment of Power and grants the player an increase to weapon damage specifically during the Oversoul Gaze phase. Players only have a few seconds to kill off the Oversoul before the entire team dies. Much like the shield in the VoG, players can carry a Sword to complete several sections of the Crota's End Raid. The sword is exactly the same as the one found on the Moon Mission: Sword of Crota. It can be used to perform several varied attacks including side slashing and forceful jump smashes into the ground. Those who have acquired Tireless Striders (Leg Armour) will have an advantage here thanks to the Swordbearers Touch upgrade which grants a temporary increase to agility while carrying the sword of a Hive Swordbearer. Agility accounts for movement speed in Destiny thus making the sword even more effective to those with this Leg Armour equipped. During the first part of the Raid you'll suffer from "Weight of Darkness" which scales from 0 - 10. As soon as you see this notification you won't be able to jump and must suffer maximum pain from the oncoming Thralls. The only way to remove the "Weight of Darkness" is to stand near a light source such as a lamp. During the final BOSS fight against Crota, all players will have the debuff called "Presence of Crota". This effectively prevents auto healing. Players can only heal by using the "Chalice of Light", which can be passed between players one at a time.